Azure Signature Series analogue output conditioners. Standard, with set points and high speed versions. The PT110LC is good for weighing where the weight of the item does not change quickly, such as silos, tanks and scales. 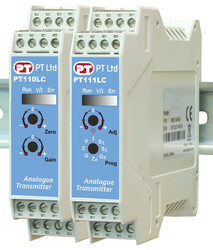 Additionally the PT111LC has 2 set point relay outputs for process control or hi or low alarms, more analogue output options and and an RS232 port for configuration via PC and AzCom software. The PT112LC is a high speed version of the PT111LC with 6 wire load cell connection and remote zero input with fast response and could also be used for filling, batching and checkweighing. Minimized zero and span drifts due to use of micro-controller technology. High accuracy, very low temperature drift 24 bit ADC and 16 bit DAC converters. Compact DIN rail mounting, size is only 22.5mm × 99mm from the front. Long term stability and low temperature drifts eliminate the need for frequent readjustment. Digital adaptive anti-vibration filter to minimize errors from environmental vibrations. All instrument have been pre-calibrated to 0–10 V and to 4–20 mA analog output ranges for 0–2mV/V load cell signal range as a factory default. Factory matching facilitates swap out without PLC readjustment. Inputs most strain gauge bridge devices (load and pressure). Analogue output, selectable 0-10V or 4-20mA. Additional output options 0-5V, 0-20mA. 2 set point relay outputs. Programmable via PC, PLC and AzCom software. Calibration without calibration weights (using load cell mV/V entry). High speed conversion, up to 800 conversions per second. Step response as fast as 25ms. Adjustable response for fast changing processes with 9 step filter. Low drift of <0.005% FSO/ºC. Increased excitation for larger installations, 8x 350Ω. 6 wire load cell connection for accuracy. Input range: 0mV to +20mV. PT112LC adjustable to 25ms fastest. Front panel: 2 Rotary switches, 3 LEDs on the front panel. Isolation: Common ground connection (VDC, GND). EMC Immunity Class E2. 0-10VDC or 0-5VDC or 4-20mA or 0-20mA (PT111LC, PT112LC). Calibration: PT110LC;- Performed with rotary switches on the front of the instrument. PT111LC, PT112LC;- Performed with rotary switches on the front of the instrument. With AzCom, can be performed via PC without calibration weights. PT111LC;- 3 step adjustable digital adaptive filter adjusted via PC with AzCom. PT112LC;- 9 step adjustable digital adaptive filter adjusted via PC with AzCom.